According to the poll, commissioned by the TVNZ broadcaster, Ardern’s rating has climbed to 51 percent, thereby leaping 7 percentage points from February. The rating of the ruling Labour Party has gained 3 percentage points, reaching 48 percent. The leader of the opposition New Zealand National Party, Simon Bridges, meanwhile, trails behind with only 5 percent of personal approval rating, which is the lowest point for him in his current capacity. His party, meanwhile, enjoys 40-percent approval rating. Commenting on the poll, Ardern declined to speculate whether her tackling of the fallout of the Christchurch tragedy had impacted the rating. "All I know is that I’m doing my job to the best of my ability. That’s what the public expects of me,” she said, as quoted by the broadcaster. The poll was conducted among 1,009 eligible voters via telephone interviews on April 6-10. The aforementioned tragic even took place on March 15, when a man opened fire in two mosques in New Zealand's eastern city of Christchurch, leaving 50 people killed and dozens injured. 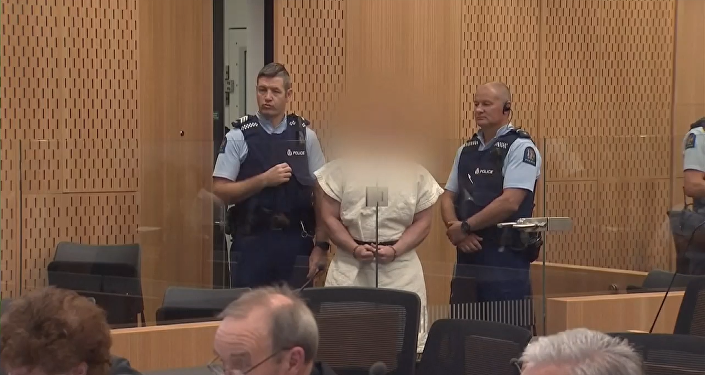 The arrested 28-year-old suspected shooter, Australian national Brenton Harrison Tarrant, explained his motives by his anti-Muslim and anti-migrant views. In the wake of the tragedy, Ardern announced a ban on military-style semi-automatic firearms and assault rifles.